This photo has little to do with the post other than that this card is pinned to my inspiration board. It is however a gorgeous card Lauren from A Stitch Too Few sent me after the event. It makes me happy! So I've started with a big statement - ALL crafters need a visual diary! And by visual diary I mean a notebook and pinterest and an inspiration board. Now before you switch off and say something along the lines of "visual diaries are for artists, not for me. I just do a little bit of crafting".....hear me out. Once upon a time I was the kind of person who said "I'm not creative". I thought that I did a bit of sewing, but that wasn't really creative as I was just following a pattern. Really creative people made stuff up, from their minds, using their ideas and they were called artists. And artists needed visual diaries to record their thoughts. Right?? Now obviously time has moved on and over time I have been shown how terribly wrong I was. I now truly believe that everyone is born creative and sometimes life gets in the way and tells some of us they aren't. Because being creative just means we have ideas - and everyone has ideas right? I wrote a post last week about the importance of passion and how to recover your passion when you are feeling overwhelmed. A lovely knitter left a comment saying that "I find that passion is fuel for my creative fire. I try to kindle it whenever I can, even if it's not always the practical thing to do." And I really think that is so so true. You need to follow your ideas when they arise as a way of playing and making crafting about the joy to keep the passion flowing. But ideas are tricky things. They aren't always good or useful and the best one doesn't always naturally float to the top. So what does this have to do with visual diaries?? Put simply, a visual diary can help you organise your ideas. I have a lot of ideas. My friends who are crafters also have a lot of ideas. Ideas about what they want to make and how they could make it and who they could make it for and what they will make it out of. And all these different ideas are swirling about, singing their own praises about what fabulous ideas they are and how you should make them rather than something else. Fine. You pick and idea. You go to the store. The store is full of a heap of pretty pretty things. All of which start singing with even more ideas. Yippee. Good for them, but not so good for you. Because you are trying to get started. You are trying to pick something. And what happens is that you pick up something pretty at the store and buy it. Because it is pretty. Herein lies the rub. I do this ALL THE TIME, and what I have found is that on the one hand it really is great. I am following the muse of the day - working with the passion. On the other hand it is ABSOLUTE RUBBISH. Terrible. Annoying. Time-wasting. I end up making random things based on the idea of the day or what was pretty. And I don't make the things that will make me the happiest in the medium or long term. A somewhat sad fact of life is that there aren't enough hours in this lifetime for me to make all the things I would like to. And when all my energy is spent following the little idea I have had on any given day (again following the passion - which is great!) there is a massive downside. I don't make the things that I really want to make. The things that would be super useful and give me pleasure every day. And a lot of this is to do with the fact that the ideas that mean the most to me, are the ones that involve the idea being fully developed, which needs some thought and time. And then there are those slippery ideas that come, are loved and then run off and get forgotten. Or get lost in the sea of new ideas. Sometimes it is just plain difficult to be able to tell if they are any good. Or if they will stand the test of time. Sometimes ideas need to brew for a while to become the best idea they can. 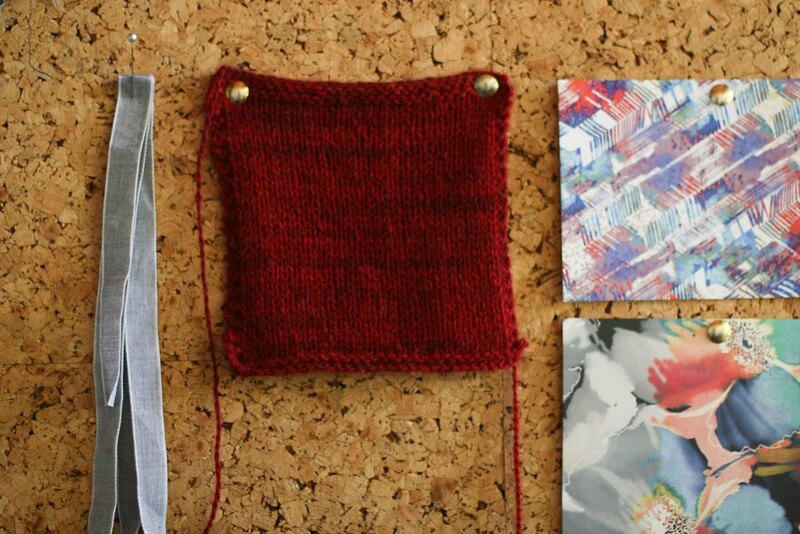 A swatch on my inspiration board taht has been waiting for the perfect project. Anyway so with all the crazy thoughts I had about creativity and artists then how did I come to have a visual diary. I am lucky enough to have a lovely friend called Anna. You may have heard me mention her before - because she is an artist who is super smart, very creative and is helping me with all this stuff (the ideas). I was talking about this idea I had for an embroidery and another one for a quilt. And I couldn't start them because I wasn't quite sure where to start. And Anna suggested that I start a visual diary (meaning that she lovingly harassed me into it). She said anytime I have an idea I should draw it, write it down, and see what happens. It seems obvious now but I wasn't doing it. She then suggested that when I found something I like the look of then I should try to develop it. Colour it, collage it, paint it, whatever. Now many of those words scared me initially and I was a little bit (very) resistant. Visual diaries are for artists remember? And she was a bit insistent and I did it. AND it has been life changing!! I have learnt so many lessons from going through this process. I now understand that visual diaries in their many forms are simply a way for you to organise your ideas. Simply very clever. When all your ideas are in one spot you can organise and prioritise based on what you most want to make. Not the random shiny idea that came to you the night before because it is most fresh. You can choose to make things with forethought and planning. I was very inspired the other day by Sophie's wardrobe planning. I love the idea of consciously planning what you need to make for your wardrobe. I'm not there yet - but I like it. 2. The visual diary allows your ideas to develop over time. Ideas often become better ideas when they are a little bit organised. By writing things down, sketching them, and working on them as they appeal to you they have the chance to improve - not get lost in the sea of other ideas. Sometimes you get perspective and additional inspiration over time, and other times you decide they need to be tossed. Both valid options. Using a visual diary was essential to how I made my quilt - something I made recently that I love more each day. I drew it, and then did another drawing of something slightly different, and then another, over weeks and weeks. And then I made a start based one of two designs. I was going to do a big circle in the middle and then randomly fill it in with random crosses. OR I was going to do a big circle in the middle and quilt the circle with rings. I put the quilt together, basted and then drew the circle onto the fabric. And then started quilting. And what came out was different again. It was simple lines of quilting horizontally about a half inch apart. And when I went back through the visual diary a few weeks later I found that there was about three different drawings of the quilt that I ended up making. It was a design that kept coming up over and over again. I don't remember drawing it but there it was. What I ended up quilting. There are also ideas in my book now that I really liked when I drew them, but that I don't like a few months later. Coming back to things after a while seems to be showing me what will stand the test of time. 3. 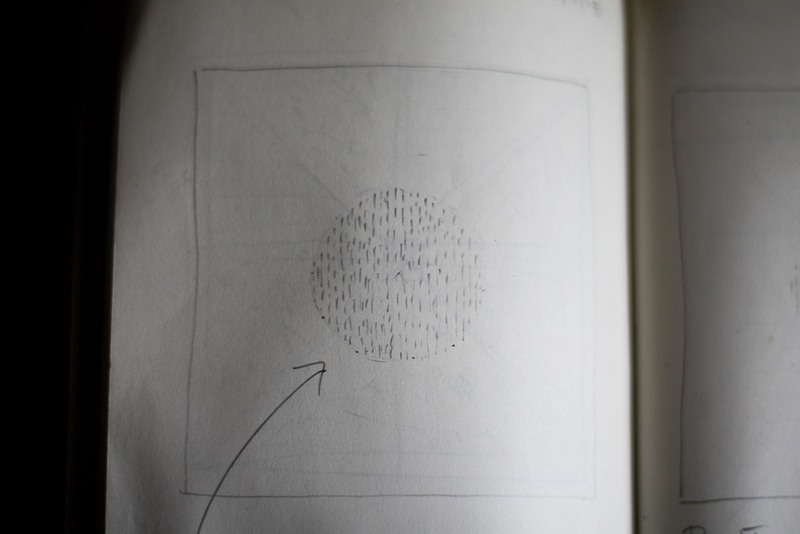 Visual diaries provide clarity about what your brain really likes - which helps you make better things. I love this part of it. By having a whole heap of inspiration and ideas in the one place I am able to see more clearly what I like. What I like is often not visible to me. I think some people are really good at this. I'm not. I get distracted in a store by all the pretty things and buy things that look appealing however my attraction to them is often short lived. What I like and what I make/buy seem to be two different things sometimes. I have fabric in my cupboard that I look at and can't fathom why I purchased it. Not always but often enough to make it a problem. Pinterest is wonderful for this. As I pin things I like, I do it in an almost unconscious way. I pin clothes I love the look of, things that I think might work for me and things I would love to wear. However my wardrobe looks somewhat (very) different to my board. It seems the things I like are not what I buy. I get confused when purchasing or making and that is why Pinterest has been such a godsend. By pinning a board over time I can see what truly appeals to me. For example it turns out that I really like skirts with a stripe that changes direction in the body of the skirt. Who knew? Have a look at the board to see what I mean. There are many other things that appear too when you look at the board as a whole. I like similar shapes, colours and styles. My wardrobe doesn't currently look like this board but by observing over time what I truly like, I am shifting it. It is inspiring and exciting. Another example of where Pinterest is helping me to decide what to make, is on my knit board - there are lots of boyfriend cardigans appearing that are long and a bit slouchy. There is also a few garments appearing using semi-solid yarn. I have the yarn swatch sitting on my pinboard and I have been looking for a pattern for a while to modify (as I am a little lazy and don't feel like making up the numbers). This cardigan idea has been a slow burn - but now the idea has set I can't wait to make it as I can see it will be exactly what I want. This is opposed to how I used to do it which is to knit the latest pretty pattern on Ravelry - which I have proven does not work for me (choosing a sweater pattern). My cardigan swatch in beautiful Shilasdair DK. Colour is natural dyed with Hawthorn. So to summarise this long and winding post, a visual diary will help you organise, prioritise, and develop your ideas. Over time it will help your ideas become the best versions of themselves. Personally I'm loving the clarity it is giving me about what I like, and over time I can see it providing more and more insight which will mean I make more and more things I love. How ace is that. It looks like all those artistic types were onto something.